High Relative Humidity followed by a sudden fall in temperature produces moisture that can be very damaging to goods in transit or in storage. Polythene and pallet-wrap will not prevent water vapour penetration – transmission rates are very high through this type of packaging. Desiccant (usually silica gel sachets or activated clay bags) adsorbs moisture produced by temperature change – typically experienced in shipping where goods are exposed to high daytime temperatures and very low night-time temperatures over several days, if not weeks. Sufficient desiccant must be used as part of a total humidity control system. The type of product, the packaging employed and how it is stored will all influence the amount of desiccant and type of desiccant to be used. Used correctly it will extend shelf-life for your products. Shipping containers themselves behave like large iron lungs whilst at sea – taking in warm, humid air in the daytime and cold air at night. Moisture in shipping containers has always been a big problem. Often referred to as “Container Rain”. 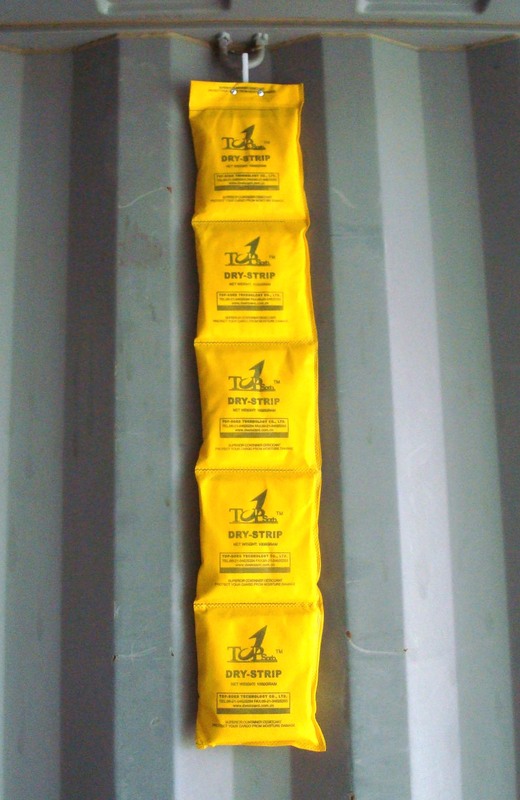 R-Tech supplies specially formulated desiccant strips with hanging hooks specifically for this application. 6 strips will protect a sealed 20ft container – 12 strips a sealed 40ft container, for a period of at least 6 weeks. The product is highly adsorptive but stays dry at all times. R-Tech will be happy to discuss requirements for your particular shipments or projects with you should you wish to contact us. If goods need protection for long periods we strongly recommend creating a closed environment using a special barrier foil developed specifically to protect against water vapour transmission. We can supply foil “bags” or “covers” of any size with a detached lid, (or base), that can be heat sealed to close the pack after the goods have been packed into it and desiccant added. The desiccant will dry the air within the cover/bag and, because it is impervious to penetration by new air or moisture, the goods will sit in a totally protected environment until the cover/bag is opened. If required, foil covers can be made large enough to enclose a shipping container! The bag is supplied flat and is inflated inside the container. The base is made from a tough foil suitable for driving over during loading. To avoid Customs opening the goods and destroying your humidity protection, these foil covers can even be made with a clear viewing “window”! For more information on the range of barrier foils available, go to: Foil Rolls, Bags & VCi.